Magnetism is a physical property produced by the motion of electric charge, resulting in attractive and repulsive forces between objects. All magnets have two ends where its magnetic effects are strongest. 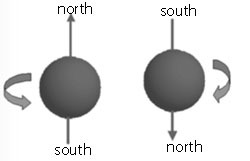 These regions are called the poles of the magnets. When two magnets are brought near each other they exert forces on each othe. Magnetic forces behave like electric forces involving attraction and repulsion. Magnetic poles always appear in pairs. If a magnet is cut in half each piece will still have a north and south pole. What is the unit of magnetic field? The term 'magnetic field' is used for two distinct but closely related fields denoted by the symbols B and H. In the International System of Units, H is measured in units of amperes per meter and B is measured in teslas or newtons per meter per ampere. Where does magnetism come from? All atoms are made up of a nucleus made of protons and neutrons which are held together tightly by a strong force and electrons which are thought of as revolving around the nucleus bound by an electric force. The electrons also rotates or spins around its own axis.The spinning of electron produce a magnetic dipole. This is one of fundamental properties of an electron that it has a magnetic dipole moment, i.e., it behaves like a tiny magnet. See image below. If the majority of electrons in the atom spins in the same direction, a strong magnetic field is produced. The direction of the electrons spin determines the direction of magnetic field. If the same number of electrons in the atom spins in opposite directions, the electron spins will cancels out. Thus, the magnetism will also be cancelled. Ferromagnetism is the basic mechanism by which certain materials (such as iron) form permanent magnets, or are attracted to magnets. In physics, several different types of magnetism are distinguished. Ferromagnetism is the strongest type: it is the only one that typically creates forces strong enough to be felt, and is responsible for the common phenomena of magnetism in magnets encountered in everyday life. Ferromagnetic materials such as soft iron are easily magnetized if you bring an iron nail close to the magnet and stroke it in the same direction then they can retain their magnetism even after removed from the magnet. The region that magnetic forces act is called a magnetic field. 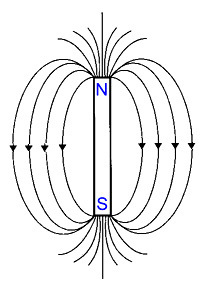 A magnetic field is represented by lines of force extending from one pole of a magnet to the other pole. 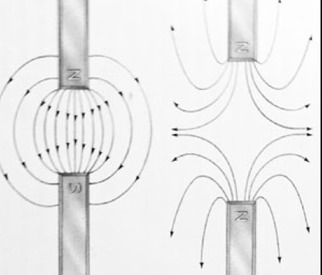 In everyday life, magnetic fields are most often encountered as a force created by permanent magnets, which pull on ferromagnetic materials such as iron, cobalt, or nickel, and attract or repel other magnets. Above image shows the lines of force between two magnets Right image shows force of repulsion between two north poles. Left image shows lines of attractive forces between the north and south poles of magnets. What is a magnetic domain? You can think of a magnetic domain as a tiny magnet with a north pole and south pole. The properties of these magnets as stated above is due to the action of the spinning electrons in atoms. Groups of atoms join in such a way that their magnetic fields are all arranged in the same direction. The region in which magnetic fields of individual atoms are lined up in the same direction is called a magnetic domain. All materials are made up of many magnetic domains. In unmagnetized materials the domains are randomly aligned in different directions and cancel each other out. In a magnet all the domains are oriented in the same direction. In the case of a nail, the domains can be aligned in the same direction causing the nail to become magnetic.When a ferromagnetic material is placed in a strong magnetic field it causes all the domains to line up and produce a strong magnetic field. This explains how a magnet can pick up a group of iron paper clips. The magnet aligns all the domains in the paper clip creating tiny magnets within the paper clip. When the magnet is removed the domains return to their random state. Even a strong magnet can be demagnetized if the domains are disrupted by force or heat. d) the region that magnetic forces act is called a magnetic field.